The 2016 Retail Customer Experience Top 100 report, sponsored by Confirmit, offers a pure list of brands and how they ranked in regard to customer service, online experience, brick-and-mortar experience and overall customer experience. 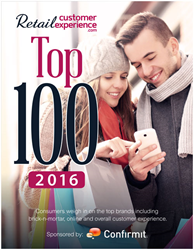 Retail Customer Experience’s 2016 Top 100 report, which highlights top online, brick-and-mortar and omnichannel players is now available for download. Our goal with this insightful report is to provide everyone in the retail industry with a look at who's doing the best job and strategy in play when it comes to forging compelling customer experiences. Retail Customer Experience’s 2016 Top 100 report, which highlights top online, brick-and-mortar and omnichannel players, offers compelling insight on retailers’ strategies in providing a robust and rewarding customer experience. "Our goal with this insightful report is to provide everyone in the retail industry with a look at who's doing the best job and strategy in play when it comes to forging compelling customer experiences," said Judy Mottl, editor, Retail Customer Experience. This year, the report offers a pure list of brands and how they ranked in regard to customer service, online experience, brick-and-mortar experience and overall customer experience. Given the increasing use of smartphones and Internet mobile devices in the retail shopping environment, the report also features critical insight on how mobile devices are impacting the retail industry, online and offline. The report offers spotlights on the top 25 most successful brands, with news of a retailer’s latest customer experience strategies, compelling news of the past year, as well as some background that readers will find interesting. The top winner, which took the No. 1 crown last year as well, likely comes as no surprise to anyone in the business: Amazon.com. Just over 60 percent of those polled in the survey listed CEO Jeff Bezos' company as providing the best online experience. The ecommerce powerhouse also scored tops in best customer experience (20.5 percent) and best overall customer experience (28.8 percent) – no other retailer even hit a double digit number in either category. Download the report to find out who's hot on Amazon.com's tail. Founded in 2000, Networld Media Group is a leading business-to-business (B2B) media communications company specializing in digital media, associations and events in the mobile, self-service, digital signage, retail, food service and financial services industries. Online properties include ATMmarketplace.com, DigitalSignageToday.com, FastCasual.com, PizzaMarketplace.com, KioskMarketplace.com, MobilePaymentsToday.com, VirtualCurrencyToday.com, QSRweb.com, RetailCustomerExperience.com and ChurchCentral.com. Networld's event properties include the Fast Casual Executive Summit, CONNECT Mobile Innovation Summit, Interactive Customer Experience (ICX) Summit, Bank Customer Experience (BCX) Summit and the Restaurant Franchising & Innovation Summit. Networld also operates the ICX Association.